Show you the real-time network activity. Create report of Internet download speed in different formats. View the data in desired units. Float on top of the screen to continuously view the download speed. These freeware can efficiently perform Internet Speed Test, are completely free to use, and occupy very little space on your computer. 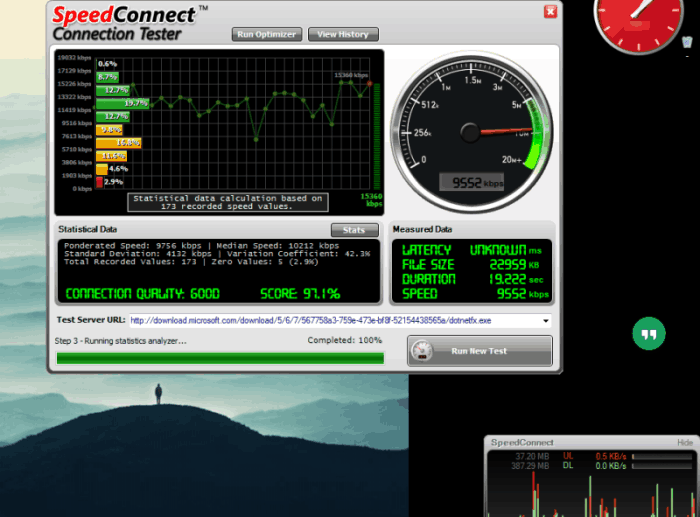 Speed Test Logger is the best, and easy to use software to test your Internet speed. What makes it so special? Its easy to understand interface, and rich features make it one of the best software to test Internet speed. Open the software, start the test, view the result on timeline, and on a table. You can even change the settings to perform an accurate test. Save the results as CSV file. You can also checkout the list of best free Internet Security Software, BitTorrent Client, and Download Managers. Speed Test Logger performs free Internet speed test on your computer. This software to test internet speed can perform multiple tests, and log the results of these tests. The logged test results can then be exported as CSV. Timeline to display internet download speed in Mbps. The timeline can be set for 10 minutes, 30 minutes, 1 hour, 12 hours, and 24 hours. Check download speed of Internet connection for a period of time, and log them to create a CSV file. Change date and time format for the log. Set speed units as Bits/second, or Bytes/second. Set automatic speed test timing. Set custom download link to test internet speed. This is an extremely light, and easy to use Internet speed test software. It downloads website data from a URL, and checks the maximum download speed. You can also set custom URL to test the speed. Go to the system tray on the task bar, and right click on the speed connect icon. Click on "Speed Connect Connection Tester". The connection speed test window appears, click on "Run New Test". View Download Speed, Connection quality, and Score. This software to test internet speed can also show you history, and statistics of the tests. 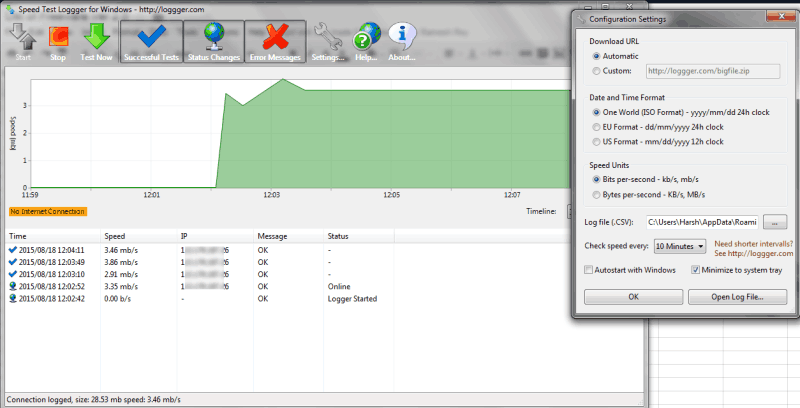 The network activity window shows the real time download and upload data, along with the total data downloaded and uploaded. 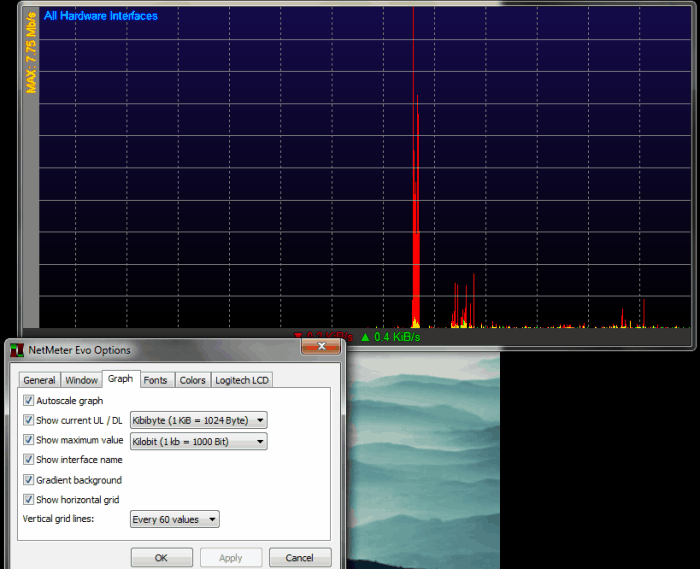 ISP Monitor is another fantastic freeware to test internet speed. Open the software>go to File>Test Speed to run the Speed test. A new window appears, click on Test to begin testing. The software downloads and uploads data to calculate the Download speed, and Upload speed. Click on Copy to copy the content of result to the clipboard. You can set this software on top, to monitor the speed. The traffic monitor displays the real-time download and upload data statistics. It also lets you change the data units. Supported languages are: English, French, Deutsch, and Netherlands. Enable, or change the transparency. Autoscale graph and grid settings. Change fonts, and color of the text and graph pointers. Show, or hide real-time download speed. Its a very good tool to keep a constant eye on your network attributes, while you are working on your computer. You can place the interface at any corner of your screen, and view the internet download speed. Set a size, or time limit to the download file. Connection timeout, and retry download settings. Auto save parameters can be set for reports. Graphical rendering of average download and upload speed of the internet. Export Internet usage report on a hourly, daily, or weekly basis in HTML, TXT, and CSV formats. Set daily Internet usage quota. Set reminder if the data limit exceeds. Trace the path of packet across Internet, Ping the connection, view network statistics, and Monitor the connection. Select from a huge list of languages for NetWorx to operate on. 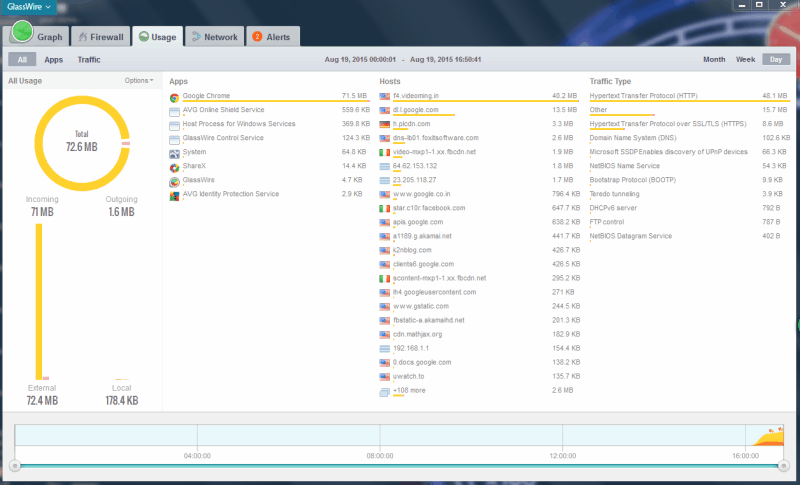 GlassWire is a multipurpose software which works as a Network Monitor, Threat Monitor, and a Firewall. If you want to test your Internet speed, simply open this software, and go to the Graph tab. The graph tab shows and stores the network usage on a timeline. It continuously plays the network usage graph. You can choose to view the graph on a timeline of 5 Minutes, 3 Hours, 24 Hours, Week, Month. Pause the timeline to view the graph, or take a screenshot of the timeline. Place the pointer at a moment to view the exact download speed and upload speed. Firewall: All network activity of your system can be viewed, and blocked from here. Usage: Shows the total Download and Upload data size. You can also view data usage division on the basis of Apps, Hosts, and Traffic Types.